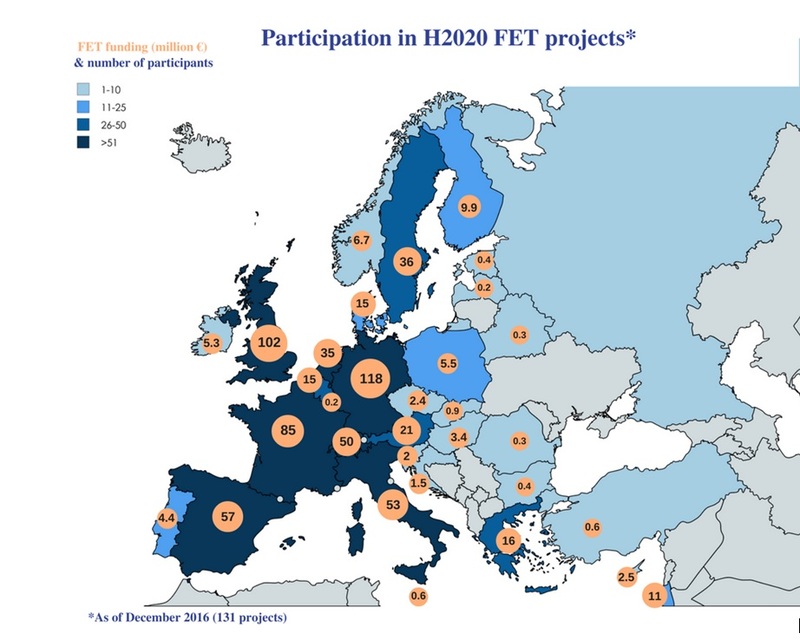 The infographic shows the participation in Horizon 2020 Future & Emerging Technologies (FET) projects, indicating the round-off number of participants per country and distribution of funding as of December 2016. Under Horizon 2020, the Future & Emerging Technologies (FET) actions have been allocated a provisional budget of 2 696 million euro to initiate radically new lines of technology through unexplored collaborations between advanced multidisciplinary science and cutting-edge engineering. Until December 2016, a total of 659 million euros has been made available to support 131 projects, including Research and Innovation Actions, Coordination and Support Actions and Framework Partnership Agreements.